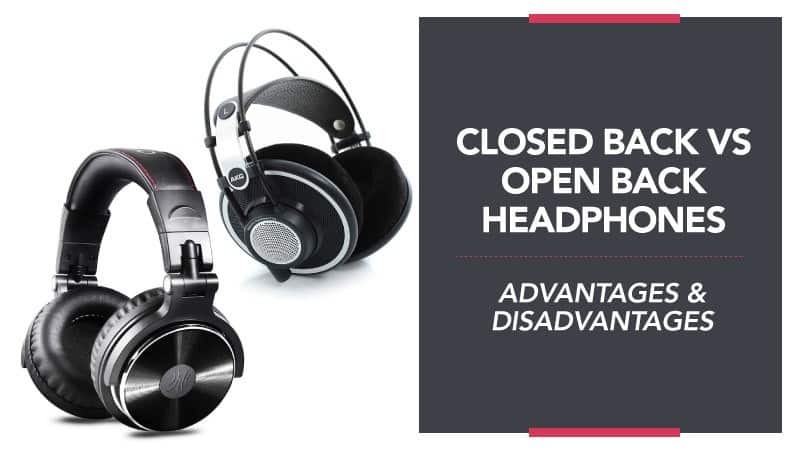 It has been long debated, and it still comes down to use and personal preference, but no one can decide if closed back headphones are better than open back ones. Both models have loads of pros and cons to go with them, which makes the decision a harder one, but we are here to lighten the load. In this article, we take you through what each type of headphone is, as well as the advantages and disadvantages that come with them. What are Closed Back Headphones? These headphones are completely closed around the back, which means that sound is only able to travel to your ear. This does mean that the music may not sound as natural as it would when using a pair of open back headphones. But what they can do is block out a lot of ambient and outside noise, so you can focus on your music instead of everything around you (and other’s can hear what you are listening to). Sometimes, you may experience a very minor echo when you get a track with heavy bass, and they may make your ears overly warm when you wear them for long periods of time. However, because they are so good at blocking out your surroundings, they make for the perfect choice if you are commuting or need to travel long distances and want to be able to shut the world out for a while. They are also really good for recording music in a studio setting, and this is because the closed backs will ensure you are only listening to yourself while you record without your mic picking up any extra noise in the process. Therefore, you end up with smooth and clear results. What are Open Back Headphones? These allow air to pass through the ear cups and to the speaker, which prevents any pressure from building up and potentially altering the sound of the audio. It also helps to prevent echoes and tinny sounds from occurring while you are listening. As a result, the finished sound often feels more natural and clearer, which is why so many of the high-end models have an open back. While this is all true, it only really applies in quiet areas like your home. Due to the design of the open back headphones, they cannot block outside and ambient noise very well, so you will be able to hear everything around you. Additionally, the design means that they leak out sound as well, so everyone around you will be able to hear your music. They are also a lot more fragile than their closed back counterparts, and this is because there is less protecting the sensitive electronics inside – especially in terms of moisture. So, they cannot be taken out in the rain, and you need to handle them with extreme care. Are Semi-Open Backs Any Good? Essentially, these are a cross between open back and closed back headphones, so the ears begin to close but are not completely sealed. This allows for some airflow to the speaker, giving them some of the great advantages of the open back models, but also all of the disadvantages. They will still leak sound in and out, just not to the same degree as those that are fully open. In short, they are great for listening to music at home, as well as casual listening where you aren’t really focussing. They aren’t so good for commuting, listening to music at work, or blocking out surrounding noise so that you can concentrate on the music. There are a good number of differences between the headphone types, as well as the sneaky semi-open variety that can offer a nice middle ground. With all of the information we have given you here, hopefully, there is plenty of advice that can help you to decide which one is going to be best for you. We’d also love to hear your thoughts, so drop us a message in the comment section below. MyAudiosound.com is a participant in the Amazon Services LLC Associates Program, an affiliate advertising program designed to provide a means for sites to earn advertising fees by advertising and linking to Amazon.com. Copyright text 2017-2018 by My Audio Sound.